Every home is different—and children are great at finding different things to get into every day. There’s a childproofing gadget for just about any hazard, from toilets to refrigerators to electronics, but you want to find solutions the rest of the family can live with. 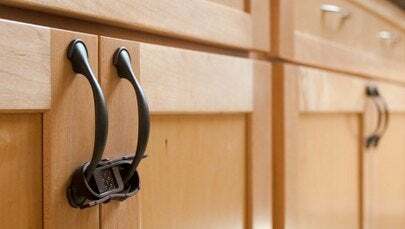 There are several adult-friendly ways to keep cabinets and doors closed, including magnetic locks you can’t see. Rather than the plug-in socket shields, which some kids can remove, try more permanent sliding outlet covers. Furniture anchor straps are great for keeping heavy TVs, dressers, and shelves from being pulled over. You’ve got to have safety gates at stair openings, but you might want one around the woodstove or fireplace, too… or to keep curious kids out of the kitchen. No matter what you choose to install, do a safety check again every six months to be sure you’re still covered as your child grows. And remember, no gadget protects your child better than your teaching and supervision.